Eric, a friend from NC, came out to visit recently and he had told me he would enjoy a camping trip while in Tucson. Knowing that Jen and I train in a very different manner than most I had asked many times about his comfort, speed, and distance preferences. Since he had previously been in the military and is about 6’4” he was relatively comfortable “walking all day”. We spoke about gear and he assured me that he would show up with a small pack, a sleeping bag (ours are way too short! ), and a water bladder. We could provide for him a tent and a sleeping pad. After talking about it and Jen looking into some options we decided to summit Mt. 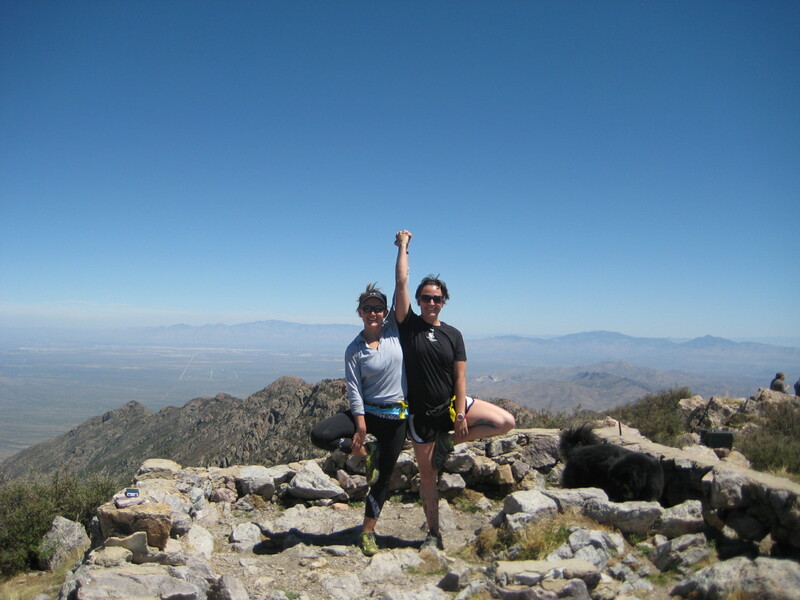 Wrightson, a “must do” hike near Tucson. Mt Wrightson has an elevation of 9453 feet, and a campsite about 1000 feet down from the summit. With a campsite so close to the trail we were able to dry camp* after our first day of hiking, summit in the morning without our packs, and then hike down. The hike up followed a much used nicely maintained trail. We turned off this trail to hike around and up the south side of the mountain. This trail opened up into one of the most beautiful views we have had in Tucson. The sun was setting in the west and our view into Mexico was stunning.